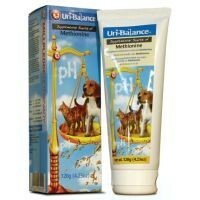 Uri-Balance Methionine Urine Acidifying Gel is a palatable supplemental source of Methionine for cats and dogs. To be used after veterinary instruction only. Methigel is extremely palatable. To stimulate taste interest, place a small amount of Uri-Balance on animals nose or directly into mouth. Should be fed alongside normal diet. Corn Syrup, Malt Syrup, White Petrolatum, Dl-Methionine, Soybean Oil, Cane Molasses, Mineral Oil, Cod Liver Oil, Water, Methylcellulose and Sodium Benzoate (preservative). the product is brilliant and really helps my dogs health but the packing is too flimsy and boxes inside the packing are always damaged. i spend over £80 a time on this, do me a small favour and upgrade the packaging!! Got this as my cocker spaniel had recurrent UTI with high PH. We tried a few other products before, including cranberry extract but this has been the most successful at keeping the pH stable. We test the PH on an almost daily basis because she still has her UTI and if ever it creeps up to 7 we just give her a little bit more and it quickly goes down. For those doubting, it's worth noting that pH can change for a variety of reasons and does get higher just after eating. It's therefore best to test a few hours after eating in order not to get a false high. One of my lads had his first UTI recently at age 6 and despite there being no struvite present I've been down that road before and at the time there was nothing available except a diet change which was suggested this time too. My lad has a very sensitive stomach and can't deviate from the food he eats at all so that wasn't really an option however nowadays there are a variety of products available that don't require a diet change and this Uri-Balance is one of them. I admit I wasn't convinced it would work but kept seeing great reviews about it online and my lad had a urinary ph of 8 that indicated his urine was indeed too alkaline so we were in danger of more infections and worse struvite. So I decided to give it a try. I give my boy about half a teaspoon a day in the morning and after a week did the first dipstick test. His ph was now 6.5 which is actually correct! I can't believe it worked so well and so fast, it was within a week it corrected the ph! He eats it fine, just mix it into his wet food and he's not even aware of it. And it's so inexpensive when bought here at Vet UK it's brilliant. I have also seen doubters say this alters the ph only for a short time after eating then it goes alkaline again and this isn't true, I test a urine sample at tea time and it's still perfectly balanced. A word of caution though, as it works so well test with a dipstick first to see if the ph is off and if so is it too alkaline? If it is and you use it be like us and test a urine sample every couple of weeks to make sure the ph isn't getting too acidic which would make oxalate stones a problem and they can only be removed by surgery so do keep an eye on things to make sure the dose is right. Otherwise it's done a fab job and I'm really pleased with it.